GENIUS NY, a business accelerator program at CenterState CEO’s Tech Garden, announced the five finalist companies selected for its third round. These startup drone companies will move into The Tech Garden in January to compete for a total of $3 million in direct investment, with a $1 million grand prize and four $500,000 awards. Finalists were selected from a pool of more than 350 submissions and include teams with international and regional representation. EagleHawk (Buffalo, NY): A drone-powered technology company revolutionizing the way commercial roofs are inspected and managed. In just two years, EagleHawk has inspected more than 500 buildings and 11 million square feet of rooftop, and is helping customers detect unknown issues, mitigate risk and reduce roof maintenance costs. Civdrone (Israel): Develops fast, reliable and autonomous marking solutions on enterprise drones for the construction industry. Digitalizing and automating land surveying services will increase productivity and shorten time of construction while lowering its costs. Sentient Blue (Italy): Develops efficient, more environmentally friendly micro gas, turbine-based power plants for use in unmanned aerial vehicles (UAVs) to increase flight endurance. ResilienX (Syracuse, NY): Is focused on improving safety in the autonomous traffic management ecosystem. Their products will increase system resilience and operational uptime by automating fault detection and contingency management, benefiting adopters through decreased expenditures in operations, regression testing and maintenance. Vermeer (Brooklyn, NY): An augmented reality drone solution that allows anyone to capture aerial photos, videos and data. A user can now design their aerial shot in an augmented reality environment and then send it to a drone to execute autonomously in the real world. The year-long competition is the largest business accelerator competition for the UAS industry in the world. To connect with the GENIUS NY teams on these and other opportunities, contact Jon Parry at jparry@thetechgarden.com or 315-470-1982. 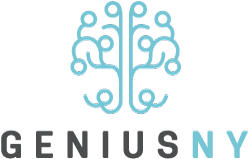 To learn more about GENIUS NY, visit www.geniusny.com. All five of the round three teams will begin the program in January focused on enhancing their business plan, and will pitch their technologies at an event in April to a panel of judges and an audience of more than 250 people, where the grand prize and runner-up awards will be decided and announced. Recent announcements by GENIUS NY teams demonstrate the quality of the program, which is funded by Empire State Development in a model similar to Buffalo’s highly successful 43North program. Teams from prior rounds continue to hit growth milestones, attract outside investments, make connections and establish partnerships with local businesses, and hire or currently have openings. The program’s goal is to encourage all participants to put down roots and stay in the region following the conclusion of the program. As the GENIUS teams graduate from the accelerator and into the business community, there are a multitude of business and partnership opportunities as they gain customers, develop their technologies, and ultimately root their businesses in Central New York. See box for details. Fotokite CEO Christopher McCall – the $1 million winner of GENIUS NY 2.0 – outlines his company’s accomplishments during the past year, including: establishing its U.S. headquarters in Syracuse; growing his team from 8 to 22, including the first two U.S. hires; closed on $3 million+ Series A funding; and negotiated a supply contract. This year, Fotokite will set up its U.S. manufacturing base and hire 10 to 15 employees in Syracuse. Fotokite and the rest of the round two GENIUS NY teams intend to remain in Central New York, and look forward to further collaborations with the CNY business community as they grow their businesses. Willard Schulmeister, founder of EagleHawk from Buffalo, New York, is one of the GENIUS NY 3.0 finalists.